Put down the Unicorn Frappucino and get outside this SKH Weekend! There are motor rallies to check out up and down the Columbia Gorge, really cool art shows that feature ceramics and fibers as well as plenty of Earth Day activities at the Oregon Garden. Get out there and have some fun! Rally racing returns to the Portland & Columbia Gorge areas for the Oregon Trail Rally Kickstart, the Friday Night Fan Fest at Portland International Raceway, will offer fans exciting racing, several viewing opportunities and up-close access to the teams. This weekend you can head east on Interstate 84 to Dufur and Hood River, which are also hosting spectator events for this race on gravel logging roads. Love pottery? The Oregon Potters Association Ceramic Showcase billed as the largest U.S. show and sale of pottery, has 150 Oregon and Washington artists at Oregon Convention Center. Free. Six Portland-area Guilds have joined forces to exhibit and sell art, fine craft, and gift items, all unique and of exceptional quality. The exhibit, also at the Oregon Convention Center, highlights artists who create with wood, glass, beads, metals, ceramics and fiber. This year’s Gathering of the Guilds include the Guild of Oregon Woodworkers, Oregon Glass Guild, Portland Bead Society, Creative Metal Arts Guild, Portland Handweavers Guild and returning this year is the Oregon Potters Association. Design Week Portland is a week-long, city-wide series of programs exploring the process, craft, and practice of design across all disciplines. The first weekend will be held at Revolution Hall and includes twenty four visionaries at the forefront of every design discipline and two days of core programming.The DWP festival then kicks into independently organized events and open houses which runs through April 28. 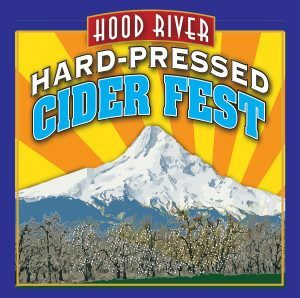 More than twenty-five cideries will be participating, with more than 50 ciders on tap at Hood River Hard-Pressed Cider Fest, which includes art & food vendors, a kids’ area, and local music in Hood River. Now in its fourth year, the Hood River Hard-Pressed Cider Fest gives seasoned and novice cider drinkers alike the chance to sample cider from Hood River County’s very own cider makers, as well as a variety of additional Northwest cideries. Official Earth Day is April 22. One of the attractions at the 18th annual Earth Day at The Oregon Garden will be the Marquam Hill Ranch Alpacas, who will be joining up for a meet-n-greet. Other activities include Earth Day face painting magic from Mary Ferguson, making your own reusable bag and learning the tricks of the trade from master composters. Free.